Good News! The daily bag limit for halibut in our fishing area (Area 3A) remains 2 per person per day with an annual limit of charter caught halibut set at 4 per year. You can keep one halibut of any size and the other the must be 28 inches or less. 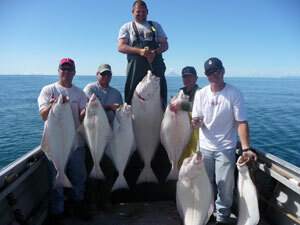 Book today and experience halibut fishing Alaska! 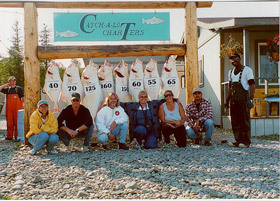 Halibut fishing in Alaska continues to be one of the most popular activities of residents and visitors alike. Halibut fishing is easy to do, and the reward when your done is, you will have some of the best eating fish in the world to take home for the freezer. There’s nothing like wild Alaska halibut! 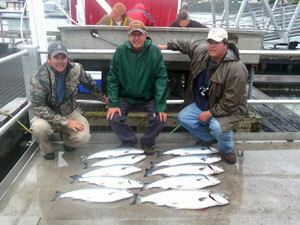 We can accommodate a large variety of fishermen, from the novice to experienced, and individuals to large groups. With years of experienced guiding fishermen we can tailor a trip to fit your needs. Your Professional Guides For Halibut Fishing Alaska! At Catch-A-Lot Charters, you will enjoy halibut fishing with our experienced, knowledgeable, licensed and insured guides. We will work hard and do everything we can to make your fishing trip as successful and enjoyable as possible. We include complimentary fish filleting as a part of every charter price. We can also vacuum pack your fish for a nominal additional fee. Target: Halibut and King Salmon. Approximately 10 to 12 hours on the water. Approximately 8 to 10 hours on the water. Fishing regulations changed this year and we cannot fish halibut on Wednesdays from June 15 to August 31. That means on Thursdays we will offer a choice of either salmon only or salmon / rockfish combo trips on Thursdays for 2016. 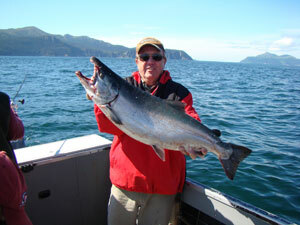 Let us know if we can assist you in booking your Alaska adventure. Each of our boats has twin outboards, heated cabins, and marine restrooms for your safety and comfort. 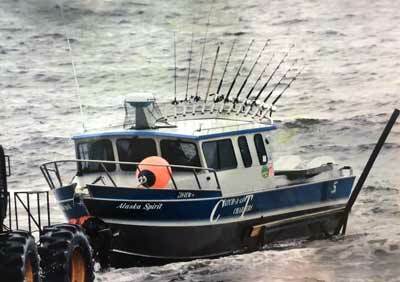 We supply top quality fishing equipment for each person on the boat. Both boats are Coast Guard equipped for your safety and all captains are USCG licensed. We encourage everyone to to dress warm and bring layers. Rain gear is also encouraged and waterproof shoes or knee boots are great to have but are not necessary. Our have warm dry cabins but all of the fishing happens out on the open deck. In May, temperatures range from the low 40s to as high as 70 degrees. June and July temperatures range from the 50s to the 80s. In the months of August and September, expect damp cooler weather with temperatures from the low 40s to the high 60s and more rain.